Experience European hospitality and personalized service! The perfect get-away destination for honeymooners, holiday makers and small conferences, the Tuscan style villa offers luxury accommodation with great sea and mountain views. The pristine Brekfis Bay beach, nature reserve and hiking trails are a stone's throw away. On the Vermont Guest House sleeps a maximum of 12 people but larger groups can be shared amongst nearby guest houses at the same rate. All rooms have comfortable, extra-length beds and large en-suite bathrooms, while some have balconies with views. Other amenities include the swimming pool, satellite TV and a beautiful communal living room with fire-place. The breakfast is delicious and other meals are available on request. Wheelchair-bound holiday makers are most welcome as the guesthouse specialises in wheelchair adapted facilities such as a lift to the first floor and roll-in shower. The scenic footpaths in Hermanus and Vermont are also wheelchair friendly. A professional tour guide service and transport from the airport is available. Two luxury double en-suite rooms with balconies with sea and mountain views, furnished with extra length beds, one with twin beds and the other with a queen size bed. Each room also has a sleeper couch. 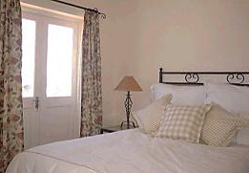 Two cosy double en-suite rooms with comfortable twin beds. Each room is equipped with a colour television, fan, tea and coffee tray, hair dryer and toiletries. Additional small room with double bed and private toilet and shower.